5 pcs. 0.77 CHF ea. from 15 pcs. 0.67 CHF ea. from 40 pcs. 0.60 CHF ea. from 80 pcs. 0.56 CHF ea. 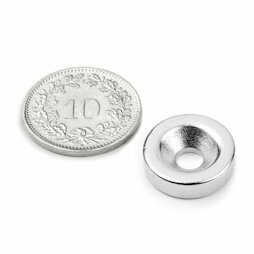 Countersunk neodymium disc magnets can be fastened with a countersunk head screw. They are only 4 mm thick and therefore very discreet for hanging up signs, tools, etc. Especially suitable for cabinetmaking, kitchen installations, booth and store construction, signage technology, etc. 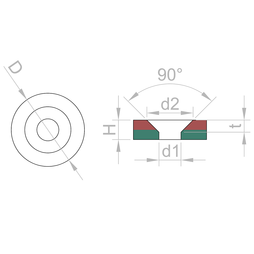 We also carry similar, but stronger countersunk pot magnets. 5 pcs. 1.22 CHF ea. 5 pcs. 1.39 CHF ea. 5 pcs. 1.05 CHF ea. 10 pcs. 0.27 CHF ea.